Excavations of coastal shell middens, like behind the Wilson Museum, above, revealed bones, shells and stone tools from thousands of years ago. 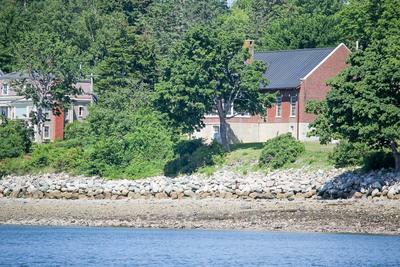 Twenty-seven people and one small dog embarked on a boat tour of Castine harbor on July 18, courtesy of the Wilson Museum and Maine Maritime Academy, with an eye firmly turned to the past. While much of Castine’s history comes from the War of 1812 and the Revolutionary War, museum director Patty Hutchins’ commentary stretched to thousands of years earlier, when native people inhabited the land, using the harbor and Bagaduce River as their waterways. “When telling the story of this area, so much happened before the fighting,” Hutchins said. Shell middens along the Castine and neighboring towns’ coast have revealed bone, shell, stone tools and other artifacts dating back as much as 5,000 years, Hutchins said, while on the banks of Nautilus Island, native peoples lay cod and other fish out to dry. Hutchins also spoke of Baron St. Castin, the French military officer whose name the village bears and who married an Abenaki chief’s daughter, living with the tribe in the 17th century. Coins attributed to the Baron were found by local farmer Stephen Grindle while plowing in the 19th century, she noted. As the launch paused within view, Hutchins described how, in 1809, Castine bought three acres and built Fort Madison. “They felt this harbor was important to defend,” she said. However, the fort was marked by insubordination, error and lawlessness, and became “more of a danger to the Americans who built and staffed it than to the enemy to whom it promptly surrendered when attacked,” Hutchins wrote in notes used for her tour commentary. In 1894, Fort Madison was turned into a public park. At a stop near a farmhouse on the Brooksville shore, Hutchins described how, in 1833, Castine bought the property to establish the Castine Poor Farm where it sent its jobless and sick to live, and work, if they could. She also provided a thumbnail history of the Majabigwaduce Plantation, established around 1762 and incorporated as Penobscot in 1787. Castine separated from Penobscot in 1796, and Brooksville in 1817. Hutchins brought along artifacts and maps to illustrate her commentary while MMA Marine Operations Manager Dana Willis, who served as launch captain, provided a brief sketch of the maritime college. 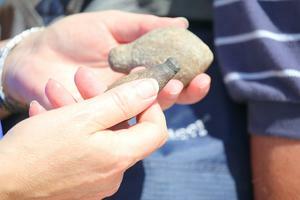 Stone tools and other artifacts illustrated commentary on the July 18 harbor tour. 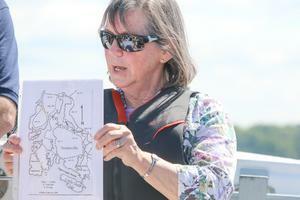 Wilson Museum Director Patty Hutchins provided historical commentary, artifacts and maps for the July 18 harbor tour.